I am reading (listening) to Plato's masterpiece, "The Republic", which discusses the philosophy of his mentor, Socrates, through a fictional narrative. As I read (listen), I find myself hearing nuggets of Socratic wisdom that we have already come to on this site. However, not many of us (at least not I) had ever read these philosophies before. So, my question is, where is the next Socrates? Well, his name was Plato. And the one after that, Aristotle. But, there it ends? Coincidentally, the three brightest philosophical minds just happened to have been friends/mentors with one another? Surely today's Socrates must exist. Perhaps among us? Please stand up. He was driven to depression byall of the jokes about how useless a philosophy degree is. 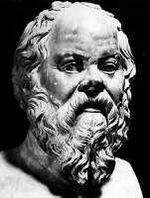 Seriously, even if someone had the gift to be a modern Socrates, would it be recognized or nurtured? Or would he be pushed into medicine or engineering to "put that great mind to some use"? Do we place enough emphasis on the soft sciences, on teaching children how to think abstractly? this modern-socrates would realize the necessity of capitalism and therefore result to some sort of creative-job that would allow him to waste his gifts on drivel, but afford him the capability to buy an SUV. ok, so that lends itself to a bigger question steve, perhaps one we'll start a new post on, but should our public schools be grooming children for single-minded marketable skills or shaping their minds for abstract thought that they might be able to pursue higher-minded (higher-profitable) careers? In response to the second question, I definitely think one of the primary goals of the educational system must be teaching students how to think, how to examine information in context, the meaning of ethnics and how you can use those ethics when making decisions, critical thinking skills. The problem is we are so results driven that most things that don't show up on state tests are being pushed to the back burner. The thing is, getting kids to think, to maybe unlock a little bit of intellectual curiousity, would seem like it would make everything else easier. My favorite class in college was a seminar on the book "Sophie's World," which is basically philosophy 101 with a framing device. It didn't get in depth enough on anything for you to really immerse yourself in any one idea, but even the overview of the key principles behind the philosophies of many of the greatest philosophers of the ancient and modern worlds was incredibly interesting. steve, fabulous point. i'm definitely with you. Although a scantron test could not grade critical thinking, there has to be some way to evaluate it, no? Actually, in a bizarre way it can, although not the way you're talking about (one of the reason essay tests are usually superior, even if the grading is more subjective). You can do quite well on most multiple choice tests, even without knowing anything about the subject itself, simply by applying critical thinking to the question and possible answers. "It Says It In The Bible"